Funny thing about privilege, growing up I didn’t know I had it. Now, however, I understand that by virtue of the color of my skin, my sexual orientation and my family history, I have benefitted tremendously from the simple circumstances of my birth. Don’t believe in privilege or simply don’t believe it has that much of an effect on life? I humbly submit that you may be more privileged than you think. That is the thing about privilege, it is a filter through which one sees every facet of life, and it is a filter that is inborn. It is only through education and relationships with others who do not experience the benefits our privileges provide that we are able to begin to see the need for change. A quick note: I am by no means an expert in this area and it is really only in the last few years that I have begun to be educated on this topic, even having been raised by parents who taught me that men and women, rich and poor, black, white, Hispanic, Asian, etc., were all equal in the eyes of God. Another quick note: you can be privileged in one area and completely not privileged in another. I think of it kind of like a continuum. 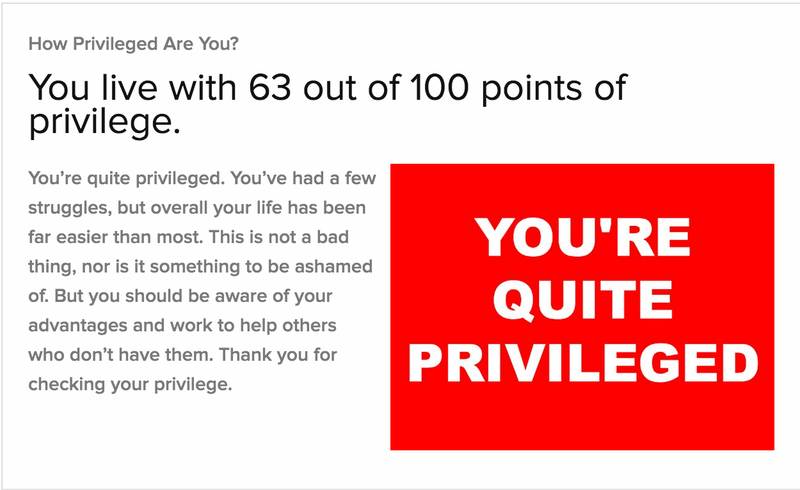 That is why I kind of appreciated the BuzzFeed quiz, as non-scientific as it is. Yes I am white but I am also female. Yes I have money now, but I didn’t always. Here’s the thing though, the statement above is pretty right on. I have had a few struggles in my life, but I have also had many, many advantages that had ZERO to do with me and everything to do with who, where, when, and to whom I was born. Let’s keep watch. Let’s perceive the slow creep of oppression, wherever it might move. Let’s be aware of the darkness in our world–or even in our own soul–that seeks, like fungus to grow. When we see it, or feel it, we pray that Christ would come into it and strike it out, making us new. We will not be victims. Nor will we be oppressors. No–today, we will keep watch. Dear God, open my eyes not just to blessings but also to the potential of evil in the world. And when I perceive it, help me move against it. Amen. So, here is the thing, if you are a man you are privileged in some ways that women are not, no matter what race you are. If you are white you are privileged in some ways that minorities are not, even if you grew up poor. If you were born in the United States you are privileged in ways most of the world is not, no matter what other disadvantages you have had. There are so many more ways in which to be born privileged. I have been trying lately to examine my own filters. I think the quiz above can help you get started. Another thing you can try is if you are a man, ask some of the women in your life to tell you about all the times they have been harassed, molested or discriminated against for being a woman. If you are white, ask some of your friends who are not white to tell you about all the times they have been harassed, molested or discriminated against for being a person of color. If you are straight, ask some of the LGBT people in your life to tell you about all the times they have been harassed, molested or discriminated against for being LGBT. Then listen, and believe what they tell you. You might be surprised at what they have to say. It isn’t a lot, but it is a start.